St Thomas More Sixth Form works in partnership with the Trinity Sixth Form. This is an exciting collaborative partnership between four schools that have a shared experience of providing post-16 education and a shared ethos that puts the whole development of the student at the heart of what we do. By working together we are big enough to offer wider choice, but in each school we are small enough to be focused on the individual’s needs. Small enough to care, but big enough to matter – and we still have ambition to offer you more. Stay in a place where you are known and, now, also have the chance to try new subjects at new venues and meet new people. Trinity’s new transport system will make that easier for you. New students from other schools are more than welcome and will realise that the opportunity for all students to study at different venues means it will be easier to fit in and mix. Each school has a dedicated Student Support Worker to ensure everyone gets the support that they need. In choosing the St Thomas More Sixth Form in partnership with the Trinity Sixth Form you are opting for an education with a personalised focus of support and stimulating challenge. We want you to be successful and ready for an exciting future. Our talented specialist staff will aim to raise your game; we want to add value to education and move you to higher levels of progress thus giving you greater choice in the future. In return we require you to be ambitious for yourself, to work hard and to support our community ethos. Whether you want to move forward to university or improve your chances of more satisfying employment, we will have the package of courses for you. If you are not sure about your future yet, we have excellent independent careers advisors to help you to make decisions. 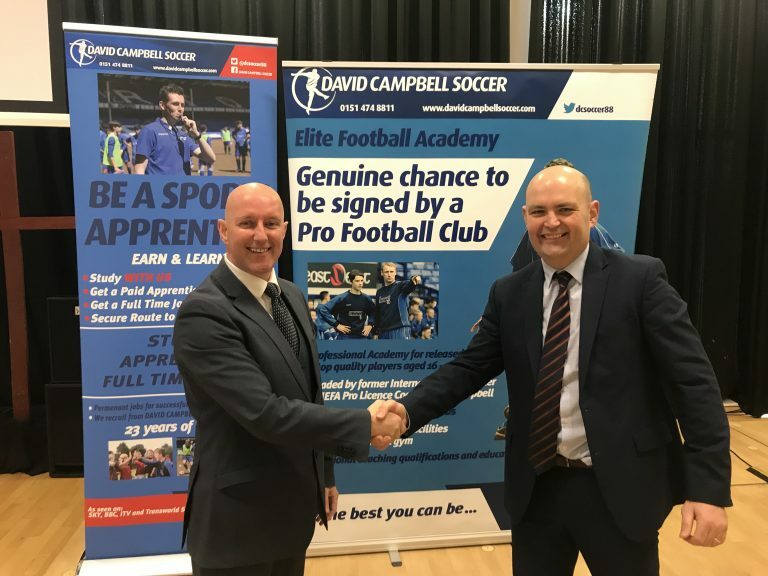 We are delighted to announce that David Campbell Soccer School will be bringing their multi-award-winning programme ‘BEST COURSE OF ITS TYPE IN THE UK’ to St Thomas More Catholic Academy. This is a brilliant opportunity for all and we are looking forward to the launch event happening on March 25th at 5pm.